It’s Christmas, 1968 – get ready for songs, songs, and more songs. 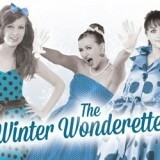 Take a nostalgic trip through the late 50’s & early 60’s when the Marvelous Wonderettes, Betty Jean, Cindy Lou, Missy and Suzy, are asked to entertain at the Holiday Party for Harper’s Hardware. While the girls decorate the hardware store, turning it into a winter wonderland, Mr. Harper, dressed as Santa Claus, goes missing, and the employees’ holiday bonus envelopes may bring surprises. “The perfect Christmas revue! Crackles with energy and joy!” (LA Weekly) Appropriate for all ages.